You could describe scuds (members of the order Amphipoda) as “shrimplike sowbugs.” Like sowbugs (in the order Isopoda), they have two pairs of antennae; they lack a carapace (a covering “back” like a crayfish has); their eyes are not on stalks; and they have several body segments with legs, gills, and other appendages. But unlike sowbugs, their arched bodies are flattened sideways, like shrimp, and the gills arise on the thorax segments (not on the abdomen). The various appendages have different purposes: armlike gnathopods at the front for feeding, followed by leglike pleopods for swimming, waving water across the gills, and other types of locomotion. Although some Missouri sowbugs live on land and others in water, our scuds are all aquatic. To identify scuds to species, and often even to family, you must be prepared to dissect them under a microscope and note many details, for example, of the appendages, including their structures and comparative lengths. Adult length: about ¼ to ¾ inch (varies with species). 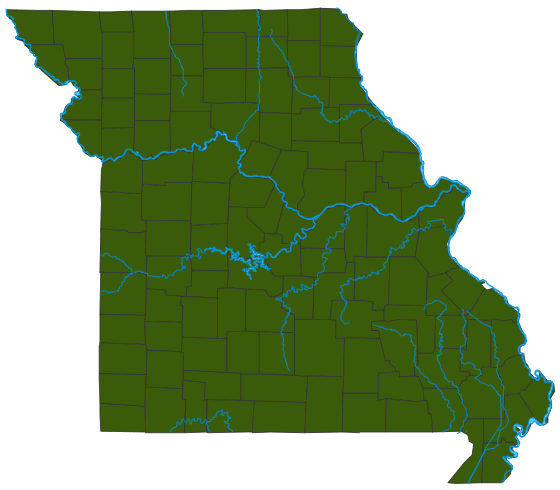 All of Missouri's species of amphipods are aquatic, and some live in caves. The size varies on the species; almost all are less than 1 inch long. Because of their flattened body shape, scuds move around on their sides by flexing and wriggling. Amphipods, like crayfish, crabs, shrimps, and sowbugs, are crustaceans. This picture of a scud shows several of an amphipod’s body parts. The head is to the left. Many kinds of fish and other aquatic predators eat scuds. Different species of scuds occur in different aquatic habitats, even deep water, but they are most often found near the bottom substrate, foraging among decaying plants and algae. Most avoid light, and some burrow into mud at the bottom of ponds. Most scuds crawl with their legs, though they can swim fairly well, too, often on their sides, giving them the name "sideswimmers." Several species are adapted to life in caves, and many of these are vulnerable to extirpation. Scuds are mostly detrivores: They feed on decaying plant and animal material, including algae and the miscellaneous organic materials that accumulate on the bottom of ponds, lakes, and streams. Ten species of amphipods are listed among Missouri’s Species of Conservation Concern, which means they are vulnerable to being extirpated from our state. Several of these are cave-dwelling species that require clean groundwater and uninjured cave systems to survive. Because their cave habitats isolate them from other places they might survive, a relatively small, localized disaster that pollutes their particular cave system could easily wipe them out completely. During mating, male and female scuds twist their bodies together, and sperm is swept into the female’s marsupium (“brood pouch”) via water currents. Females can produce hundreds of eggs per brood; they keep them in the brood pouch until they hatch. There is no separate larval stage; the young look like small versions of the adults. They become sexually mature after growing and molting several times. Most people are scarcely aware that amphipods exist, but as surely as humans are attracted to seafood restaurants for lobster and shrimp, fish and other aquatic predators seek out scuds to eat. And many of those scud-eating fish end up on human dinner tables, too! Missouri is “the cave state,” and it is important to remember that a cave is more than just a hole in the ground — it is a living community of organisms with unique food chains. Cave amphipods, like the scuds that live aboveground, are important scavengers and prey species in their ecosystems.